I am very impressed by this Figgy pattern. 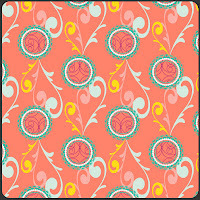 Figgy is known for being modern and contemporary, and this is what drew me to the pattern in the first place. I am so happy with my finished product, I wish Braelyn was old enough to wear it now. It is listed as an advanced beginner difficulty on the cover, and I would have to agree. I think this is a great project for anyone who wants a little challenge with rewarding results. Prewashing: A lot of people ask me about prewashing fabric. I must admit I personally have a very lazy approach because I do not dry the clothes I make for myself. Also, it is very convenient for me to pick out fabric at the shop and just start cutting. I have learned with the few children's clothes patterns I have done that it is a good idea to prewash. I always dry her clothes and I've already had to tackle a few tough stains so I prewashed this fabric. A tip I can give you for prewashing is to serge (if you have a serger) or zig zag the raw edge before you wash your fabric. This will help with the unraveling and save you about an inch of fabric. Tracing Patterns: Another thing I always do with children's patterns is trace them. Brealyn grows so quickly I do not want to buy a new pattern every time I want to remake a project. Patterns for myself I have always just cut out with the hope I will never grow ;). I have found just using freezer paper from your local grocer is the best way to trace patterns. It's cheap and you can even iron the pieces to the fabric which can make for a quick cut out. You can also "rub" the pattern onto the tracing paper, this works with most patterns. What I mean by "rub" is that with wax side down you can rub the freezer paper over the pattern with an eraser or the end of your seam ripper and the ink will transfer onto the wax side of the freezer paper. I do suggest writing the name of the pattern piece, the size, and any markings with a pen. Also, make sure to transfer the grain line or fold lines with a pen and a straight edge. I have used a lot of different bloomer patterns but this one is my favorite by far. Without the ruffles it is reversible and it fit almost perfectly. When I decided not to monogram the Mamie dress I decided to monogram her bloomers. My friend Heather's baby has the cutest monogrammed bloomers and I have been looking for a good pattern to use with a monogram. 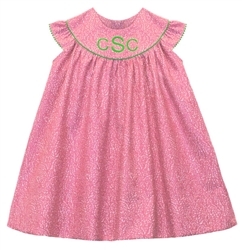 The best part of this pattern is that it is lined so if you decide to monogram or applique them it will not rub on the diaper. The pattern does come with 5 applique designs and directions on how to add ruffles. The bloomers are durable and a perfect fit. I do wish the pattern came in larger sizes. 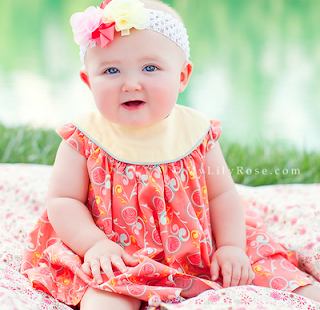 The pattern runs XS (newborn)-XL (18 months). I feel a little weird posting a picture of my daughter's bottom but it's just too cute not to. Please feel free to post pictures of your baby with these bloomers on! Mention the blog and get 10% off the pattern. This is such a classic dress. I have seen and helped so many people make it that I had to make it myself. I made the 12 month size so my daughter could wear it for family photos. I chose to use Art Gallery fabric. You will start to notice I am a sucker for Art Gallery fabric. I just love the way it feels and I love all of the bright exciting colors. I will say, it is sometimes hard to coordinate Art Gallery fabric if you are a matchy matchy type of person. Luckily I am not, so Art Gallery is perfect for me! Although it was hard to match I'm happy with the dress. I went with a butter twill for the yoke and a blue piping. I also chose to use snaps instead of buttons. I don't mind making buttons or sewing them on I just hate getting the dress on and off my crawling daughter. Non of the colors are exact but I think they all complement each other well. The dress was not hard itself but the instructions were a little hard to follow. The "little tips" throughout the instructions were helpful but they used a lot of sewing terminology that some people may not be familiar with. I would This would not be a good project for a new sewer or someone who has not had formal instruction. I love that patterned called for french seams. I think it makes it look much more professional Braelyn loves pulling her dress up so french seams look much better then a zig zag or a serge. I do hate hand sewing and because I usually refuse to do it I am not very good at it. You are required to hand sew in the yoke lining, the bias strips under the arms, and the hem. I machine stitched the bias strips under the arm holes and the hem. I don't think anyone noticed:) I did however hand sew on the yoke lining. In the future I will not use twill on such a small yoke. I have to iron it to make it lay flat (I'm sure my hand sewing did not help). Also, the hem was very long. Brealyn is a long baby in the 95 percentile for length and it was still too long on her. I cut almost 2" off the bottom before a 1/2" double folded hem and she still had problems crawling in it (could be a good thing). We attended my sister-in-law's MUSC graduation and had family pictures taken in the dress. Everyone loved it. Most people did not think it was hand-made. The piping gives it a very professional look and the classic silhouette looks great on any baby. I would love to make it for 4 or 5 year old to see if I still love it, I'm sure I would. If I were going to make it for an older child I would add ric rac to the sleeve seams (there are directions in the pattern) and sew up most of the back only putting in a few buttons at the top. I know when I was little I hated sitting on buttons. 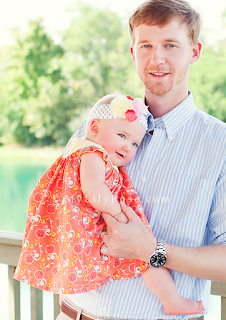 Here are some of the family pictures we took. 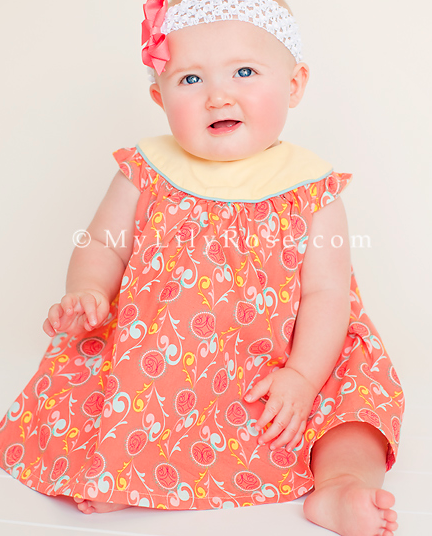 Please feel free to post pictures of your Mamie dress! All professional pictures were taken by My Lily Rose Photography. As Laura posted before, I will be sharing with you some of the projects I will be working on over the next couple of months. The greatest part of owning a fabric store and teaching sewing classes is that I get to see other people create wonderful new things everyday. The downside is that I have not had much time to create myself. Besides one Wednesday morning class, I will be taking some much needed time to sew. Those of you that know me know that I have an 8 month old baby girl, Braelyn, and a few of you know I am expecting again! Although it is still early, I know I need to get a lot of sewing done before the new baby arrives and I have two to chase after. During these next couple of months I will try to tackle 20 patterns. Most of the patterns will be children's clothes however, as much as I love them I will need to sew for myself from time to time. I have already started my list!! Here are some of the projects I would like to start with. I will be starting off with the Mamie by Children's Corner. I have heard both positive and negative things about Children's Corner patterns so I am looking forward to finding out the truth about them. 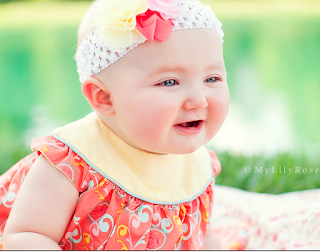 This is such a classic dress and I know Braelyn will look adorable in it. For Pattern 20, I chose to download another one of Jennifer Paganelli's patterns, the "Patricia Tunic" (downloaded at www.sisboom.com). Along with many of you, I have made the "Schoolhouse Tunic" by Sew Liberated, a great tunic we always recommend as a great pattern. The "Patricia Tunic" is a little different in that it has versions for all types of sleeve options including short sleeves, 3/4 length, and long sleeves along with making the finished sleeve a bell shape. The finished tunic also has open slits on the lower sides (the pattern calls these vents), and the ability to choose to make a contrasted front and back facing along with contrasted sleeves. Like the "Rebecca Shift Dress" I made last time, the "Patricia Tunic" pattern comes in sizes 0-26 with very clear and detailed directions on how to alter this pattern to fit you better. How to make a "frankenpattern" is also explained for all of you who find that patterns never fit you just the right way and need to make adjustments. For the tunic, this could really come in handy since many people who made the "Schoolhouse Tunic" had trouble getting it to fit well if they were larger busted and had broader shoulders. I had no trouble sewing this tunic, and I actually finished it on Friday when I was working in the store. I immediately put it on a mannequin to display. I made the shirt length version but there are many different length options available. The tunic was not difficult to sew at all, and the sleeves were much easier to attach than the "Schoolhouse Tunic" which requires to you to gather the sleeves to fit. I was so glad that my last pattern of 20 came together easily and ended up looking great! I am "sew happy" that I ended up making my goal of sewing 20 patterns this summer. It was difficult occasionally to find the time to sit down and sew, especially with working at the store, training for my half ironman (which feels like a part-time job in itself), working on house remodeling projects, and actually trying to rest and relax before school starts. I can say, however, that it has been great getting the opportunity to sew such a variety of patterns, things I would have never chosen otherwise. I also have an amazing back-to-school wardrobe with all of my finished garments! I really appreciate all the positive feedback you have given me. Many of you told me how much this blog helped you choose patterns or inspire you to sew which made my work feel worthwhile. I want every one who chooses sewing as a hobby to love it as much as I do! Because of this, Brooke and I have decided that we really don't want the blog to end. We love sharing our experiences with you, and we want the opportunity to help you find patterns that are great or give you tips to help not so great patterns turn out that way! Since I have to go back to school on Wednesday of this week (insert tears here), I will not have as much time to sew or blog as I did over the summer, but we want to have as many up-to-date blogs as possible for you. 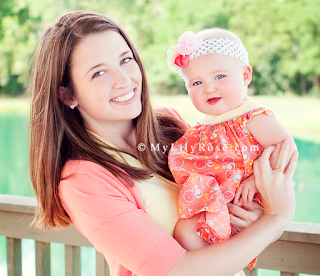 To make that happen, Brooke and I are going to share our postings on the "Sew Happy" blog. Brooke will be posting all of the projects she makes for her little girl Braelyn along with all the other things she makes for herself and her home. I will continue providing feedback on the adult patterns I sew along with other projects I have in mind for Christmas presents! 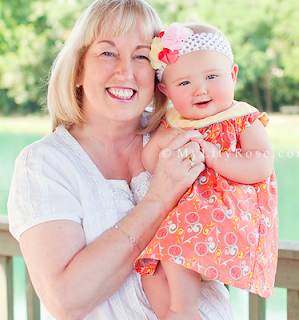 Between the both of us, we hope to inspire you to make wonderful things with beautiful fabrics! Not sure how you'll know who is posting? Just check the bottom of each post that will let you know if Brooke or Laura is doing the writing. Thanks again for all of your support to finish my 20 patterns. Stay tuned for my next post when I rank the 20 patterns from worst to best! Pattern 19: Sis Boom "Rebecca Shift Dress"
For Pattern 19, I decided to use a downloadable pattern from Jennifer Paganelli's (a great fabric designer) website. 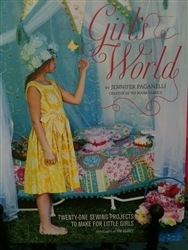 You may not have heard of Jennifer Paganelli, but if you've been in our store, you've definitely noticed her fabric. 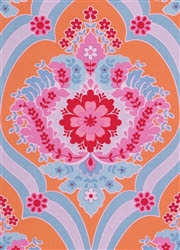 We adore her gorgeous fabrics with their bright bold colors. 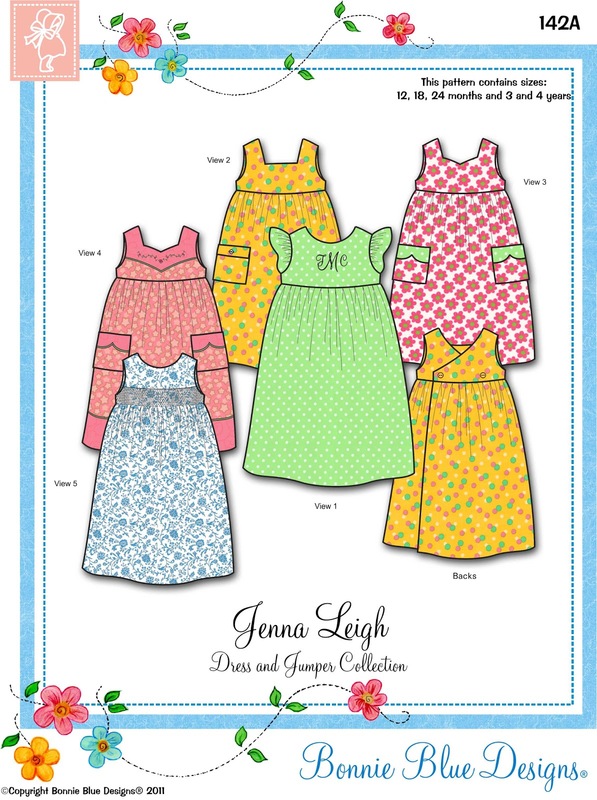 We also love her book "Girl's World" which includes great sewing patterns for young girls . I couldn't wait to go to her website www.sisboom.com to download some adult clothing patterns that I knew would be great based on our other experiences with her products. 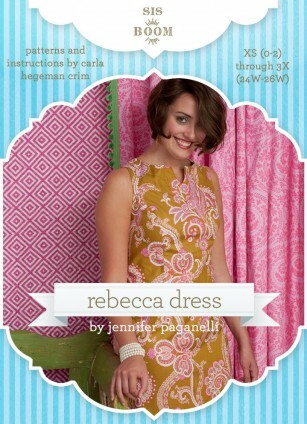 I downloaded several patterns and chose the "Rebecca Shift Dress" for Pattern 19. Most of the patterns are $10, a very good price considering that the dress pattern I downloaded came in sizes 0-26! The pattern ends up costing you more if you consider printing costs, however. The pattern is 471 pages long because it includes separate pattern pieces for all sizes (no searching among multiple cutting lines to find your size) and very detailed instructions, but I only printed out the pattern pieces for my size (about 18 pages). You then have to cut out the pattern pieces, fit them together kind of like a puzzle, and tape the correct pieces together to get the actual pattern you use to cut your fabric. I didn't print out the sewing instructions. I kept the laptop nearby to read from as I finished each step. 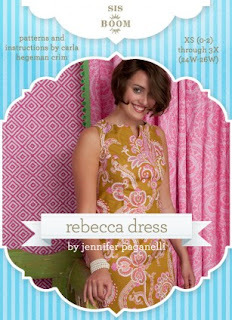 The directions to the "Rebecca Dress" were excellent! I found them very easy to use. 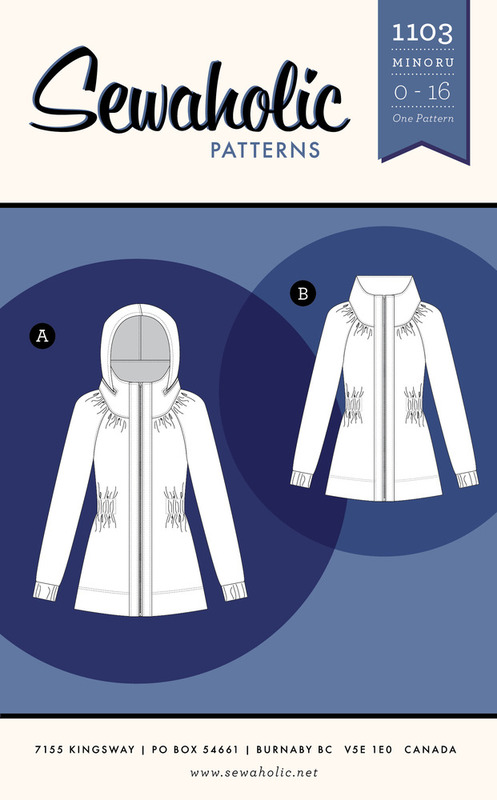 What impressed me the most was how well the pattern explains how to alter the pattern pieces to fit your measurements. There are 6 pages of instruction on how to make the dress to fit you perfectly! If you are one of those people that find your waist and hip measurements on the pattern sizing chart but find those are significantly less or more than the bust measurement indicated, you probably get frustrated because you have trouble deciding what size pattern you need. 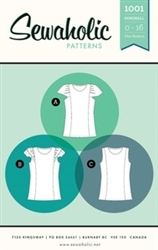 This pattern has a solution called making a "frankenpattern" where very specific details are given to help you alter the pattern to be perfect for you like increasing the bodice size for a large bust without making the bottom pattern pieces any larger. It also does a great job of giving many different length options for all heights so you can cut the pattern pieces out to the perfect length from the beginning instead of waiting to try on the dress to find the perfect hem length. I altered my pattern by choosing to make the bodice pieces in the tall length because I have a long torso but the other pieces used were for the regular length since I'm only 5'4. I chose to make the knee length version so the dress would be school appropriate. The fit of the dress turned out perfect for me! I really love the look of this dress. The contrasting facing (in blue) was a design option the pattern explains how to do, but it also gives you the option to make the dress using just one fabric. Brooke made an Amy Butler dress out of this same fabric, and I really liked it so I copied her fabric choice. Imitation is the greatest form of flattery! This dress looks like one you would buy at a clothing boutique, and I adore it! Of all the things I've made so far, I think this dress is my favorite! 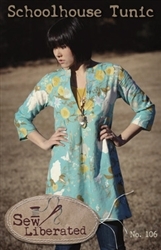 I have decided to download another pattern from www.sisboom.com for Pattern 20, a long sleeved tunic I'm hoping will be a good piece to add to my wardrobe for fall! I can't wait to see how it turns out. Pattern 18: Anna Maria Horner's "The Socialite Dress"
Like so many other patterns I've chosen for this blog, the "Socialite Dress" pictured on the pattern cover didn't look like something I'd ever want to make for myself. I do like some things about this dress like the fact that it has pockets (which is so convenient! ), and it is sleeveless which is perfect for these hot summer days. It has a V-neck that isn't too plunging so I wouldn't need to wear a tank top underneath it to hide any potential cleavage revealing issues if I wanted to wear this to school. Despite these great points about the pattern, let's focus on the main reason why I (and most everybody else who comes into my store) hasn't bought this pattern? This obviously thin girl is wearing a dress that makes her appear to have extremely wide hips! It is very unflattering on her, and if this cute model can't pull off looking good in this dress, there is no way I could! When you flip the pattern over, you see a better version which is why I decided to give this dress a try. When the dress is cinched with a belt, it looks much better! 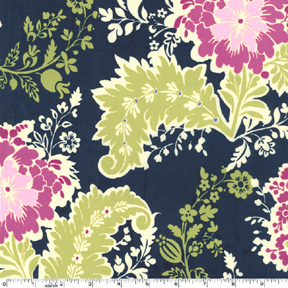 I chose this fabric from Michael Miller to make my dress. 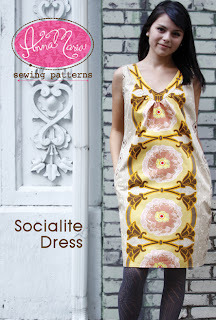 The "Socialite Dress" has gathers around the front and back yoke, pockets, and you have to attach bias to the armholes. 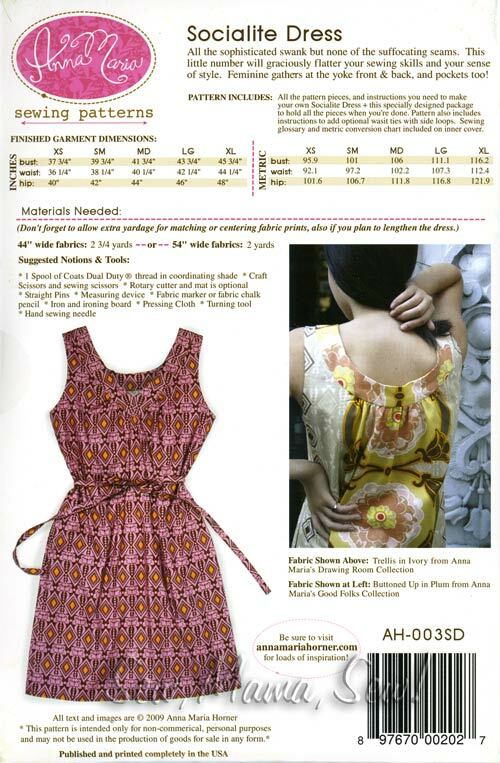 There is no zipper installation required which makes this pattern easier than most dresses. The only difficult part of sewing this dress was attaching the front neck facing and back neck facing to the front and back yoke pieces. It was quite cumberson to get the facing folded to the inside of the dress neatly, and I found it difficult to catch the facing in the seam as I topstitched the front yoke. Anna Maria Horner's patterns are easy to follow, and she gives very specific instructions on how to complete most steps. For example, she clearly explains how to gather, so well in fact that you wouldn't need any previous experience gathering to know exactly what to do. The only complaint I do have about her patterns is that she doesn't tell you when you should finish the seams or edges. For example, I used my serger to finish the edges of my pockets before attaching them because I know how obnoxious and difficult it is to serge them after attaching them. The pattern, however, gave no indication this should be done. When sewing the front piece to the back piece, I serged the seams to finish them but again, the pattern did not tell you to do this. I've been sewing all summer and now do things by habit whether the pattern tells me to or not, but if I hadn't been, I would have sewed things together before finishing edges and would have had trouble making a professionally finished garment. Besides that, this is a great pattern I would recommend for the advanced beginner (just because of the gathers and neck and back facings you may find difficult). I finished the dress last night, and took it to the store this morning to take pictures on the mannequin since it was raining. My husband didn't think the dress looked as good on the mannequin so he convinced me to put the dress on for pictures during a brief moment when the rain stopped. A wet building and parking lot doesn't make the best back drop for a picture, but at least you can get a better idea of how the dress looks on a human! I am very pleased with how the dress turned out, and I know that I will love using these pockets! As if I haven't sewn enough skirts this summer, I went ahead and chose another skirt pattern for Pattern 17. I do love skirts in the summer, and they are usually very easy to sew which is why I make so many of them. I chose the "Isabelle" skirt from the "Girlfriends" clothing pattern line which is a knit, a-line skirt made up of 6 panels. The waistband is elastic. As you can see in the picture above from the front of the pattern cover, the panels of the skirt make a tighter fit at the waist but flare at the hem. I wanted to use the elephant fabric shown in the picture but sadly, we sold out. I then talked myself into making a plain skirt out of brown knit because I thought it would be a great basic to add to my wardrobe. I made the skirt out of our great bamboo knit in chocolate brown, but I wish I had chosen something different because the solid brown skirt was so boring to sew, and I wasn't excited about my sewing project. The entire time I sewed the skirt, I kept thinking what a waste of time it was to make a skirt that wasn't unique that I could probably buy at most stores. And honestly, I don't hardly ever wear brown. It just isn't me. Thinking ahead about my fall wardrobe, I picked the fabric but I wish I hadn't been so sensible and just picked something I really loved. As you can see from the picture above, I don't think it turned out very well. Although I have loved other things I've used with the bamboo knit, I didn't like it for the construction of this skirt. The panels of the skirt require you to sew a curved side to a straight side which made my fabric pucker a lot even after I ironed it (which you can see in the picture above on the left side of the skirt!). Also, the fit of this skirt is tighter at the waist and hips and with this fabric, it showed every lump and bump underneath, not a flattering situation for most of us! The pattern calls for 1/2 inch elastic to be attached in a casing for the waistband, but I chose to use the wide brown ripple elastic on the outside of the skirt. I prefer not to make waistbands with the elastic in a casing unless I'm sewing pajama pants because I don't feel like the finished garment looks professionally done this way. I do like how the outer elastic turned out and would suggest you doing the same. Although I don't like how my skirt turned out, I do think the pattern is very simple to use and could make a really cute skirt if you choose a cotton jersey knit that has a little more weight to it. 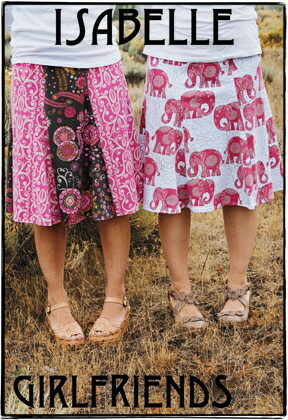 The elephant fabric would have been the perfect thickness and texture for this skirt! The bamboo knit was just too thin and slinky for this style, and I would suggest staying away from knits like this if you make this skirt. I won't be wearing this skirt because I feel like the puckered seams scream "bad sewer", but I will give this pattern another try with thicker cotton jersey knit. Many of you read a previous blog where the finished product, a cardigan, didn't turn out very well. I decided this skirt will join that cardigan in my dog Shelby's wardrobe. She looks good in every thing she wears! I chose to sew another Sewaholic Pattern for Pattern 16, the "Pendrell Shirt". Before going any further about the fabric I chose, I need to explain a few things and make a confession to those of you who may think I am an expert sewer. 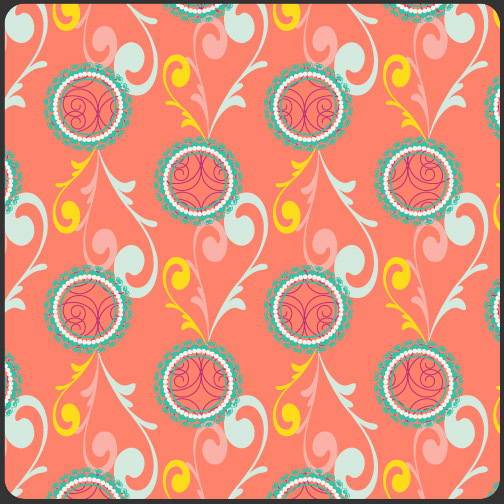 I have never sewn anything successfully on silky, slinky, shiny fabric like those recommended I use for this pattern. 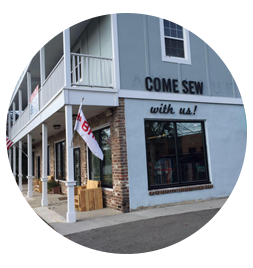 We have several bolts of charmeuse and georgette in our store that Brooke ( my business partner) and I ordered when we first opened, but then we realized that most people didn't know how to sew with it and were scared to buy it. The even worse part is that Brooke and I have no experience sewing on it either so we can't even teach our customers tips on how to sew with it. I almost put the pattern back. I didn't want to try to use the fabrics I've always tried to avoid especially now when I will need to blog about how the finished product looks. Besides, I don't even know what crepe de chine is! But then I thought of all of you who are afraid to sew with the knits that I adore. People say to me all the time, "I don't sew on knits. Knits scare me so I stay away from them and only use cotton" to which I always reply "Oh, it's so easy! Don't be afraid to use knits. You just have to get used to them and then you'll love them!" I decided I should take my own advice and push away all the fears I have about sewing on satin fabrics and give it a try. You know the old saying "practice what you preach"! 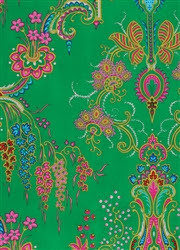 So, I picked out a charmeuse fabric we have in our store patterned with peacock feathers in bright colors. At only $6.25 a yard, I can afford to try it even if it ends up being a disaster. I've liked it for a long time but never considered using it since it was in my "forbidden fabrics to use" category. Excited about accepting this sewing challenge, I jumped right in and pinned my pattern pieces to the charmeuse and began cutting. This was my first mistake since I didn't use very sharp, small pins recommended for silks and other fine fabrics. I made a few tiny runs in my fabric, but none were noticeable so my first error didn't really affect me. Next came the cutting where the fabric slipped and slithered all around as my scissors tried to navigate around the pattern pieces. I tried to hold the fabric down with my hands, but it still kept moving so much! When I finished cutting, my fabric had very uneven, jagged edges and I couldn't even tell where I tried to cut out the triangles I would be needing later to line up pattern pieces. That's when I realized my second mistake. You should really use pattern weights (lots of them from what I later learned from researching the web) and use a rotary cutter with a new blade to cut out your pieces. It prevents the fabric from slipping around as much. I will definitely try that next time. I did change the needle in my sewing machine to a new ballpoint needle (Size 10) and started sewing. I used lots of pins to keep the pieces together while sewing, and I had to stop often to realign the fabric. The ballpoint needle worked wonderfully, and I didn't put any new runs in the fabric. I sewed with the stitch length at 2.0 instead of 2.5, another suggestion from the web. Putting the bias strip around the neckline and armholes was the most difficult to do because even after ironing the fabric with a folded edge, it doesn't really stay pressed like cotton does. This made the fold roll more when sewing so it doesn't look perfect if you inspected it closely on the inside, but it isn't noticeable on the outside. 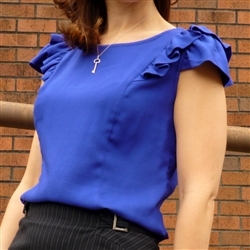 The shirt has a very nice drape to it, and it doesn't have to be tucked in if you prefer not to do so. It is long enough to wear out with a belt around it to cinch the waist for another look. I am definitely going to use this pattern again with more silky fabrics so that I can get experienced and knowledgeable enough to teach a class on working with these difficult fabrics. The pattern also suggests using a lightweight jersey knit which would give this shirt a different look. Maybe I'll try that as well and go for the ruffled or capped sleeved versions available. I definitely recommend this pattern for its ease of use and great finished fit. An advanced beginner could easily sew this but if you aren't used to this type of fabric, take the suggestions I've reviewed below. 1) Use pattern weights (or heavy objects around your house like coffee mugs) to help you cut out the fabric. 2) Use a rotary cutter with a new blade. 3) Use small, very sharp pins made for silks and other delicate fabrics. 4) Use a ballpoint needle (size 10) on your sewing machine. 5) Make your stitch length a little smaller (like 2.0). 6) Stop sewing often to make sure your fabric pieces haven't shifted away from where you placed them. Although my finished product isn't perfect, I'm still proud of tackling a new fabric. I challenge all of you to try sewing with something that scares you. If the fabric is inexpensive enough, what do you have to lose?